Most parents choose a rear-facing-only (RFO aka. 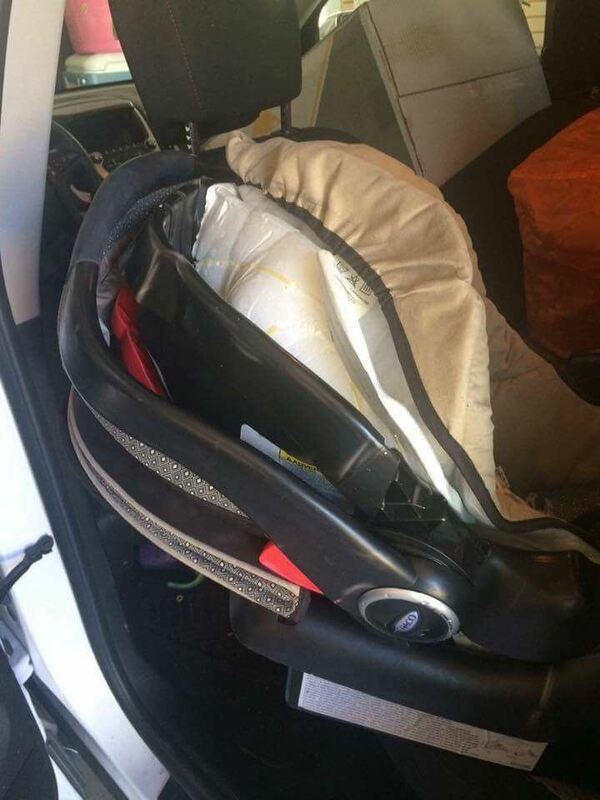 Infant / bucket) seat for their baby's first car seat. The advantage of the infant seat is that the seat can be removed from the base which stays installed in the car. This is convenient for carrying baby into the house to avoid the elements, attaching to a stroller for quick errands, moving from one vehicle to another, etc. However, it's important to understand that with this added convenience, comes added risk. Infant seats are very easy to overuse. 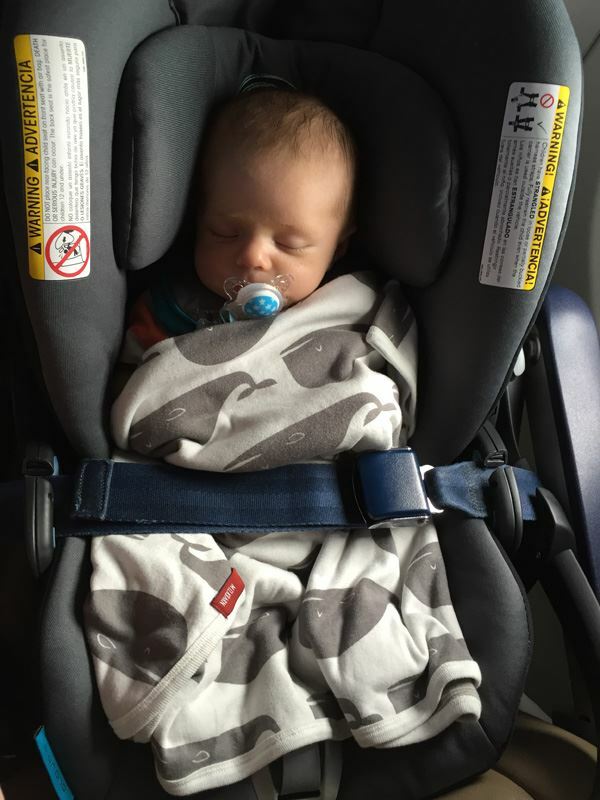 While it's ok to let baby fall asleep in the car seat, babies should be transferred to a safe sleep environment as soon as possible. When a baby is in a semi-elevated position, his oxygen saturation can drop to a dangerous level over time. It's recommended that healthy / full-term babies spend less than 2 hours at a time in their car seat regardless of whether the seat is in the vehicle, attached to a stroller, or sitting on the floor. Criteria for a "car seat challenge" (technically named angle tolerance test) varies by hospital but it's usually for babies under 5lbs, before 37wks, or babies who have been on oxygen. In this test, a heart rate and oxygen monitor is hooked up to baby while properly harnessed in the car seat. Baby is monitored over time to ensure his heart rate and oxygen stay at healthy levels for the duration of the test. AAP recommends this test be done for a full 90 minutes. If a baby requires this test, the time frame for which the test was administered should be used as the maximum amount of time the infant should spend in the seat until the infant is at least 3-4 months (adjusted) old. These same guidelines should be used for any device that keeps baby semi-elevated...strollers, bouncy seats, swings, rock-n-play, etc. Limit their use until the infant is at least 3-4 months (adjusted) of age. Flat is best for a newborn. It's also critical to properly harness the child in the car seat or any other device at all times. Infant deaths prompted car seat manufacturers to have to include new labeling right on the seat warning against the risks of loose or unsecured harnesses. A loose or unsecured harness can allow baby to slip down where they strangle on the loose harness or they fall into the "v" shape of the seat and the chin is pressed to the chest preventing the child from breathing. If you are going to use the car seat outside of the vehicle, while following the time guidelines listed, be sure the seat stays at a proper angle and that the child is always correctly harnessed in the seat. My baby is outgrowing his infant seats...what do I do next!?! First it's important to understand the limits of your current seats. Most infant seats are outgrown in height, long before weight. In addition to height limits, most seats also require that the top of the shell of the seat is at least 1" above the child's head. Regardless of which limit is met first, the child has outgrown the seat and needs to move on to the next stage. The next stage car seat is called a "convertible" seat. This refers to the fact that it can be used rear facing and forward facing. Children should remain rear facing until AT LEAST 24 months but preferably 3-4 years of age. How many convertible car seats do I need? This number will depend on how many vehicles the child frequently ride in. Since convertible seats remain installed in the vehicle (vs. clicking in and out of a base), you probably want a convertible seat for each vehicle the child rides in regularly. You may find it easiest to purchase the same seat for each vehicle...or you may choose to buy more "full featured" seats for your primary vehicle and more basic less expensive seats for your secondary vehicle(s). ALL car seats are safe when used correctly. Do I buy a new convertible seat or pass down my older child's convertible seat? Can I skip the infant seat and just buy a convertible seat to use from birth? What convertible car seat do you recommend? Probably the most frequently asked question I get is “what convertible seat do you recommend?” This is such a hard question to answer because it’s so personal. There are recommended seats ranging from $45 to $450+. Do you get a safer seat when you spend more? Not necessarily. All seats pass very strict standards and beyond that we can’t compare safety “ratings” (although the new Consumer Reports data is getting much better but it’s still not a resource I recommend yet). Typically when you spend more on a seat you get more features. Sometimes these are designed to improve safety, sometimes ease of use. Proper use is by far the most important factor. Most people move to a convertible seat around a year. It just needs to be done before your child outgrows the infant seat (likely in height before weight). While leg room isn’t a safety concern, it’s a common reason I hear for parents turning their children around much too soon. There are car seats on the market now to address this “concern”. If you want extra leg room for your child, check out the Graco Extend2Fit or if you have a larger budget, the new Nuna Rava. Do I need a car seat on a plane? YES! The FAA recommends children ride in an approved car seat on the plane until they properly fit the adult lap belt (typically around 40lbs). However, if your 40lb+ child needs a seat at the destination, then the seat should be used on the plane to ensure it arrives, and arrives in good condition. 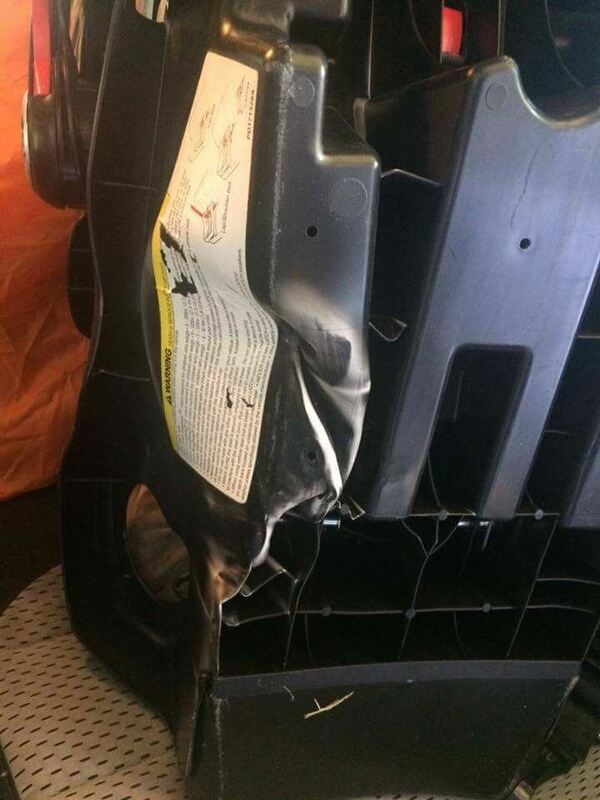 Airlines do not cover damage to seats so if your seat arrives completely destroyed, and it happens often, you're left scrambling at the airport like the owners of this gate checked seat were. While airlines permit children under two years of age to travel as "lap infants", the only way to ensure you have a seat available to use your child restraint on the plane is to purchase the child a ticket. The coffee pot has to be properly secured during take-off and landing...shouldn't your child be given the same (or better) protection? 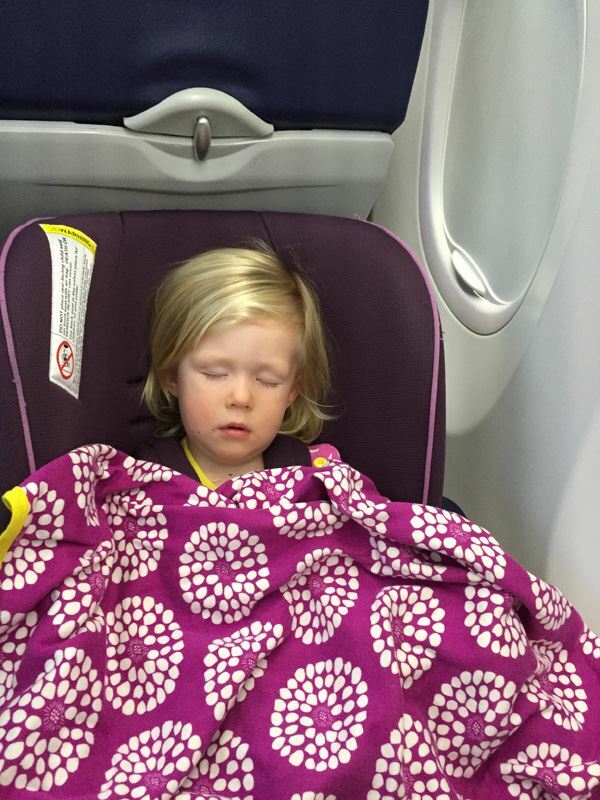 In addition to the safety benefits of traveling with car seats, your children will probably be more comfortable and more likely to sleep on the flight. Here are my two youngest (26 months and 2 months) during our summer trip. Laws permitting lap infants have been around since the 1950's when it was normal for children to travel unrestrained in cars. We've progressed since then in the field of child passenger safety. Forward facing seats should ALWAYS be installed using the tether. All forward facing harnessed seats should be installed using the tether (that little strap that goes over the back of the seat and connects to the vehicle in a designated place…not to a cargo hook!) This means that you may be somewhat limited in where you can safely install a forward facing seat as vehicles are only required to have three tethers. Lower anchors (the part of the LATCH system, the two connection points found in the crease of the seat) have a limit to them so at some point you’ll most likely need to install your seat with the seat belt. Tether should be used with either seat belt OR lower anchor installation. Seat belt and lower anchors should not be used at the same time unless your seat specifically allows it. HINT: yours probably doesn't since there are only two. 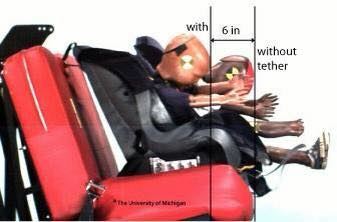 If you need help determining where your tethers are, consult the child restraint section in your vehicle manual. These seats pictured are both properly installed with the exception of the tether. This can easily be the difference between your child striking the seat in front or not. What is the most common error parents make when it comes to car seats? The most common error is not selecting the right car seat or moving to the next stage too soon. When it comes to car seat safety, moving to the next stage means less protection. Use the following guidelines to determine if your child is in the right car seat for their age. 0-2+ Children should remain in a rear facing seat until at least two years old, preferably 3-4 years old. Rear facing offers up to 5x more protection. 2-5+ Children should continue to use a 5 point harness seat until they are 5-6 years old, not the legal minimum of 4. This is because most children are not mature enough to sit correctly 100% of the time in a booster seat. 5-8+ Children should use a booster seat until they are able to pass the "5 step seat belt test" which typically doesn't occur until around 4'9" (on average between 10-12 years old). Want to meet with a technician? MOMS hosts a free car seat check event each year in August and March. If you would like to meet with a certified child passenger safety technician outside of our two events, please visit this website to find a local technician.